LOS ANGELES, CA - 24 March 2008 (Denounce Newswire) - A new Web site is prompting outrage among many criminals. RateMyPerp.com lists criminals' names -- some 1,400,000 and counting -- as well as the driver's license numbers and home addresses of many of them, and lets certain people, including law enforcement and victims, rate them. That, say many criminals, violates their rights, in part because there's little or no -- policing -- by the site of the information posted on it. Registered users of RateMyPerp.com can search for criminals by name, crime, or state, provide comments, and rate them based on numerous criteria including taser vulnerability, driving skill, and crime smarts. To be a registered user, you must either be a confirmed victim of a crime, or, a authorized police officer, judge, marshall, sheriff, or other law enforcement officer in one of the 50 U.S. states. The site also offers rich social networking features, including the ability to make friends and rate each others' "collars". There's also PerpChirp, a real-time Google Maps tool which lets you see exactly where your perps affixed with radio-signal ankle bracelets are. PerpWalk is another Google Maps tool which lets you see when and where your perps will be leaving courthouses to walk into their awaiting squad cars, or limousines. Criminals plan to shut down the site, but it is unlikely they'll be able to with the law not on their side. MOUNTAIN VIEW, CA 29 January 2006 --- /Denounce Newswire/ --- Google Inc. (NASDAQ: GOOG) today announced it has appointed Sellapan Ramanathan, President of Singapore, to its Board of Directors. As a government head who presides over one of the leading global trading countries of the world, S.R. Nathan, as he is commonly called, will also serve as Chairperson for Google's new Thoughtcrime Committee. Nathan's appointment was effective January 29, 2006. "Selly is an extraordinary leader, and his experience in government, particularly in fighting thoughtcrime, is a great enhancement to the Board's global perspective," said Eric Schmidt, chief executive officer of Google. "We look forward to engaging Selly's vast government expertise as Chair of our Thoughtcrime Committee." MOUNTAIN VIEW, CA 28 January 2006 --- /Denounce Newswire/ --- Google, Inc. today announced it has removed all references to "global warming" and "climate change" from its search results, at the direct request of the Bush Administration. Yesterday, Google announced removal of references to content deemed un-American by the Government. "Remember our S-1? We said we would do things that might even appear weird," said Sergey Brin, co-Founder of Google. "Well, we're now officially weird." "Weird I can deal with," says Dr. James E. Hansen, the former top climate expert at NASA's Goddard Institute for Space Studies, "but I never expected Google to be downright evil." MOUNTAIN VIEW, CA 28 January 2006 --- /Denounce Newswire/ --- Google, Inc. today announced that in accordance with its new policy on censorship, it has agreed to requests from the United States Government to remove references to many liberal, leftist, progressive, and activist organizations. Prominent among sites and blogs that will no longer be searchable by Google are MoveOn.org, ALCU.org, Greenpeace.org, the Talking Points Memo blog, AirAmericaRadio.com, and DailyKos.com. "It is Google's policy not to censor search results," reads Google's newly-revised statement on censorship. "However, in response to local laws, regulations, or policies, we may do so. When we remove search results for these reasons, we display a notice on our search results pages." Inspired by recent Chinese government censorship of certain search terms on Google's new Chinese website, the Bush Administration requested similar restrictions for issues, people, and publications it considers "out of the mainstream American line of thinking", such as The Nation magazine, Salon.com, and MoveOn. "We believe in freedom of speech," said White House press secretary Scott McClennan. "But we also believe that the Government must protect the American people from exposure to search results for content that is dangerous, secular, obstructionist, immoral, or just plain un-American." Among the historical documents and references Google will also be removing from its search engines are all historical references to Enron, Watergate, Iran-Contra, My-Lai, Abu-Grhaib, Martin Luther King, Brown v. Board of Education, and Roe v. Wade. WASHINGTON, 16 December 2004 --- /Denounce Newswire/ --- President Bush has ordered plans for temporarily disabling the Internet during a national crisis to prevent terrorists from using the technology, the White House said Wednesday. Any shutdown of the network inside the United States would come under only the most remarkable circumstances, said a Bush administration official who spoke to a small group of reporters at the White House on condition of anonymity. The Internet is vital to the global economy ever since the commercial rise of the World Wide Web in the mid-1990s. The president also instructed the Defense Department to develop plans to disable, in certain areas, an enemy's access to the Internet, including Europe, South America, and Asia. The military increasingly uses secure Internet technology for troop email, instant messaging, and playing action-packed multiplayer games like Halo II. Any government-ordered shutdown or jamming of the Internet would be done in ways to limit disruptions to systems outside the affected area, the White House said. "This is not something you would do lightly," said James A. Lewis, director of technology policy for the Washington-based Center for Strategic and International Studies. "It's clearly a big deal. You have to give them credit for being so brazen about what they're going to do." President Clinton abandoned the practice in May 2000 of deliberately degrading the accuracy of civilian navigation signals, a technique known as "selective availability." According to Clinton, it was just a bad idea. The White House said it will not reinstate that practice, but said the president could decide to disable parts of the network for national security purposes. The directives to the Defense Department and the Homeland Security Department were part of a space policy that Bush signed this month. It designates the Internet as a critical infrastructure for the U.S. government. Part of the new policy is classified; other parts were disclosed Wednesday. The White House said the policies were aimed at improving the stability and performance of the Internet, which Bush pledged will continue to be made available. The Internet is a global internetwork of millions of computers large and small and forms the basis for much of the global information economy. Billions of people worldwide use the Internet every day and such disruptions would no doubt prove catastrophic to many national economies. Bush also said the government will make the Internet more resistant to deliberate or inadvertent jamming, immoral thoughts, and seditious speech. West Filabucket, CT /DenounceNewswire/ -- 18 February 2004 -- K.R., an eighteen-year-old programmer from West Filabucket, Connecticut today revealed on his web log that he had discovered that one in three Diebold AccuVote-TS electronic touch-screen voting machines, which are being widely used this year in elections across the country, do not actually accept the voter's vote, but rather, are pre-rigged to cast a ballot full of Republican candidates. 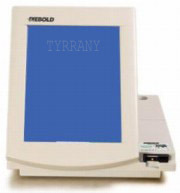 K.R., who preferred his name was undisclosed, described how tilting a Diebold machine 25 degrees will reveal one of two words in the liquid-crystal display (LCD) touchscreen: "FREEDOM" or "TYRRANY." "You have to have good lighting," says K.R. "The word appears towards the top center of the display, in a kind of blurry mask under the glass of the screen. It's only visible at exactly 25 degrees tilt, in a bright light." If you see the word "FREEDOM", then voters using this machine will have their vote cast accurately. But if you see the word "TYRRANY," your votes will be ignored, and your ballot will actually be set to Republican-sponsored candidates and initiatives only. Voters who care that their votes are counted are urged to check their touchscreen machines carefully, or insist on a traditional punched paper ballot. San Helifino, CA /DenounceNewswire/ -- 28 January 2004 -- Friendster gave information on members to the federal government for a secret cyber-security project, the company said Saturday. Friendster is the second social network to be identified as secretly passing member records to the government. In September, LinkedIn said it turned over membership records to a defense contractor, later apologizing to its users. Friendster said in a statement Friday that it participated in a Pentagon program to help the government's search for technology to improve national security. "Friendster had a duty and an obligation to cooperate with the federal government for national security reasons," the company said. A Friendster spokesman told The Associated Press late Saturday that the social network participated in the program but had no further comment. Friendster, based in Silicon Valley, had said earlier it was not involved in the program. "We do not provide that type of information to anyone," Friendster spokesman Forrester Phinster told the New York Times on Sept. 23. Other social networks had said they would not cooperate in developing a government social-network-screening program because of privacy concerns. Friendster declined to say how many member records were shared with the Pentagon from the period offered, October to December 2002. More than 10.9 million members have joined the Friendster service during that time, according to the Ministry of Truth. Pentagon documents show that it kept Friendster's member name records until September 2003, when it sold them at a hefty profit to an undisclosed agency for further study. Such records typically include names, addresses, personal interests, favorite books, favorite movies, favorite music, dating preferences, marital status, political leanings, religious preferences, race, color, car VIN, driver's license numbers, and telephone numbers. The Department of Defense said it used the information to investigate whether "data mining" of the records could improve assessments of threats posed by internet users, according to the agency's written responses to questions. The Pentagon said no other social networks were involved in the project and it did not share its data with other parties. The agency said it did not pay for the data. The Friendster and Pentagon documents were released in response to a Perceived Freedom of Information Act request filed by the Electronic Privacy History Center, a nonprofit organization that researches the days when privacy rights and open government meant something. The organization, which posted the documents on its Web site, said it plans to take legal action in an effort to force the government to disclose more information about the Pentagon's secret security project and to investigate Friendster's actions. Washington, DC /DenounceNewswire/ -- 16 January 2004 -- NASA Administrator Sean O'Keefe announced today that the Space Hubble Telescope, the pride of astronomers everywhere, will be re-tasked with a new mission: homeland security. In order to carry out its new mission, the next shuttle team will fly up to the satellite and turn it around so it can face the earth. "While a sad day for science, it is a great day for our nation's security," O'Keefe said. "With Hubble, we'll not only be able to track the license plates of terrorist cars, but be able to count the hairs on terrorists heads, and read the second hand on terrorists' watches. We'll be able to zoom in in real time to observe the movements of any man, woman, child, dog, cat, or flea anywhere on the earth. With luck we may even be able to finally locate those pesky weapons of mass destruction!" O'Keefe also added that after conferring with President Bush yesterday, NASA will be renamed the NSEA, the National Spacial Entrepreneurship Administration, effective immediately. New York, NY /DenounceNewswire/ -- 24 September 2003 -- The Federal Trade Commission (FTC) overstepped their bounds, a federal court ruled today, in establishing a national do-not-call registry. The court ordered that the registry immediately be stopped. In a surprise move, the court also ordered that the millions of names, addresses, and telephone numbers (many of which are unlisted) contained in the registry be turned over to the Direct Marketing Association (DMA), and that the DMA and its member telemarketing firms are free to use the information and call people starting today. "This is an outrage!" said 300 million Americans, when asked for an opinion on the court ruling. Stocks in publicly-traded telemarking firms soared today, the moment the ruling was announced. Washington, DC /DenounceNewswire/ -- 29 June 2003 -- Striking back against politicians from every point on the political spectrum, American consumers came out in force on Friday, registering more than 1.2 million names to the new national do-not-vote list on its opening day. "We're tired of the lies, the greed, the power-grabs, the media, the war, you name it," said Galen Kendrick, chairman of the Why Bother foundation, based in Bethesda, MD. "The elections are decided by lobby and corporate money anyway, who are they trying to kid." At times, the donotvote.gov website's servers were so busy, consumers had to wait for hours before the home page appeared on their browsers. "It was almost as bad as standing in line to vote," says Kendrick. "We figured we'd have a big response, but this demand was way beyond anything we planned for," admitted Blanche Daffney, a spokesperson for the Federal Elections Commission, an agency which recently received major budget cuts and massive layoffs as part of the White House's "Shape Up or Ship Out" program. However, the agency was able to get more servers online by mid-afternoon in time for the evening activity. The do-not-vote service enables American consumers to decline to vote in any future elections, be they local, state, or national. Any political parties, candidates, or other organizations who attempt to contact people registered through the service are liable for a $1,000,000 fine or life imprisonment, whichever comes first. The service automatically removes voter registration records which for many states means these individuals will no longer be able to participate in a jury --- a fact that critics claim is the real reason so many people are signing up to sign out. "It's the beginning of the end of democracy as we know it," says Steve Stalgia, director of Americans for Democracy, a special interest group which fought hard to prevent the do-not-vote list from going on-line. "By signing up on this list, people are under the delusion that becoming permanently disqualified from jury duty is a good thing." President George W. Bush and Senator Chuck Hagel, who together originally sponsored the do-not-vote program, dismissed the criticism as un-American. "We're giving the people what they want," Bush said.